I was delighted with the fact that the band founded a label! But when I checked out the poor information for the label I saw that it will not provide the necessary promotion and distribution of the band’s product. So at the moment you are reading about a band from the underground which deserves a wide publicity! The thrash metal basis of the music has a specific psychedelic guitar reminding of CORONER. Heavy passages as if from ANNIHILATOR alternate with rather melodic solos as if from the later DEATH. The aggressive vocals of Garcia lead the gender in the direction of the early death metal classics. At the same time the connection to CORONER is not lost. The complex compositions have their own style but remind about intellectual bands like PSYCHOTIC WALTZ, MEKONG DELTA, NOCTURNOS, GRIP Inc. The album ends with cover songs of CANCER and DEATH. These songs underline the analogy with the early death metal scene, but they are interpreted in the style of FROM NOWHERE. Although that the solos during the whole album remind me of Andy LaRocque in DEATH, in ‘Sacred Serenity’ this is avoided and the solo is reduced to simple terms. The creations of Armando Garcia and Co. are elite and combined with anti-easy listening concept which indeed is impressing. 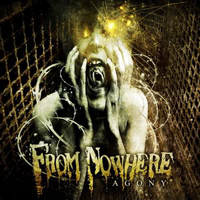 The music of FROM NOWHERE is not for everyone but this band should be heard by more fans. Frequently such bands become a cult without being a mass hysteria.